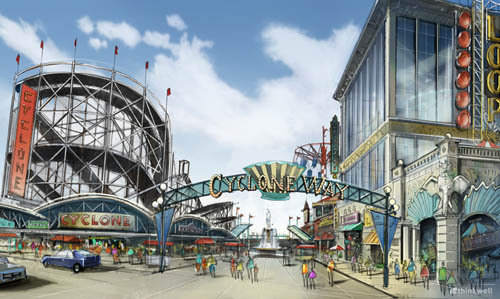 These are two more updated renderings of Thor Equities vision for Coney Island that were passed along yesterday. The view above is one of W. 10th Street. One of the most notable things about it is that it depicts a new structure around the base of the landmark Cyclone. 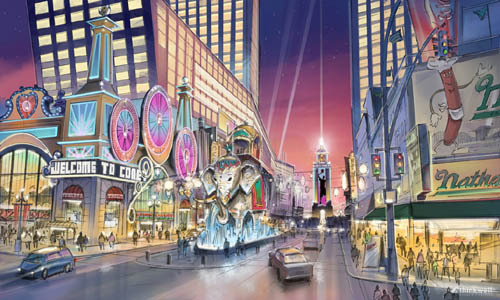 The building on the north end of the Astroland site look to be four-five stories tall. There is also a fountain at the end of W. 10th Street and the entire street looks like it has been turned into a pedestrian area, which drivers won't like, but which makes clear sense on a number of streets leading to the Boardwalk in Coney Island. The would be much more lively and pleasant as pedestrian-only thoroughfares. The view below depicts Stillwell Avenue and Surf Avenue. Nathans is seen on the right. We deal with some of the major points of the rendering in another post today comparing this new rendering to older ones.